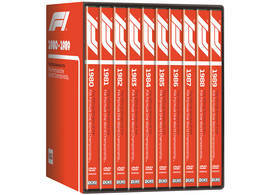 The product "DVD Collection Formula 1 1980-1989 on 10 discs" was successfully added to your wishlist. The complete collection of Formula 1 history of the 1980s in this fantastic film collection. For the first time the thrilling turbo era with its over 1,000 hp cars is available as a complete collection.See the turbo battles of Ayrton Senna, Alain Prost and Nelson Piquet and many more. Running time more than 20 hours, English language.